Usually characterized by high ceilings, masterful sculptures, prestigious stonework, and dashing interiors, churches are often regarded as works of art, transcending their initial purpose. Therefore, it comes as no surprise that they sometimes get stripped of their religious role and become buildings intended for secular use, housing various institutions, concert venues or private residences. On this list, you will find some of the most interesting takes on turning a church into something else. 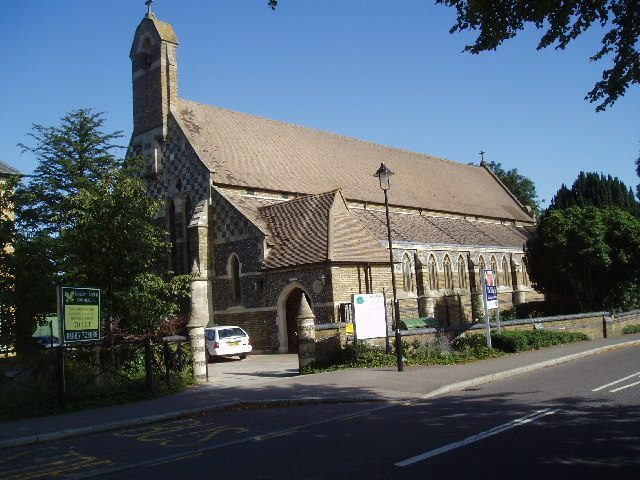 Starting off the list is a former military chapel in Caterham, Surrey, that was once part of a barracks complex used by the British Army. In 1995 the barracks were officially closed and the chapel was later turned into a skate park, as a result of a youth conference held in 1999. Filled with various obstacles, ramps, quarter pipes, and jump boxes, it attracts extreme sports enthusiasts from all over the U.K., and currently holds an active membership of more than 4,000 members. Churches have traditionally been associated with literacy, writing, and publishing. This church, built in 1294, continues the tradition in a way suitable for modern times. The medieval Gothic monastery dedicated to Saint Dominic has actually been out of order since Napoleon turned it into a field HQ during his conquest in the late 18th century. During the following centuries, the church has been used as the town’s archive, a warehouse, and as a bike store. The most recent renovations were completed in 2005. 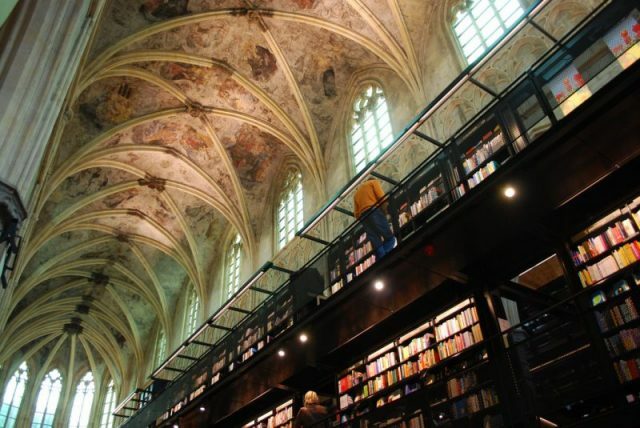 The church was transformed into a posh two-story book store that occupies a space of 1200 square meters, reserved only for literary pleasures. All of the monastery’s remarkable frescoes are preserved and are in good condition ― the most notable paintings from a series depicting the life of Thomas Aquinas, a Dominican friar and an influential scholar of the Catholic Church. Jean-Marie Roy was certainly an architect with a unique vision. 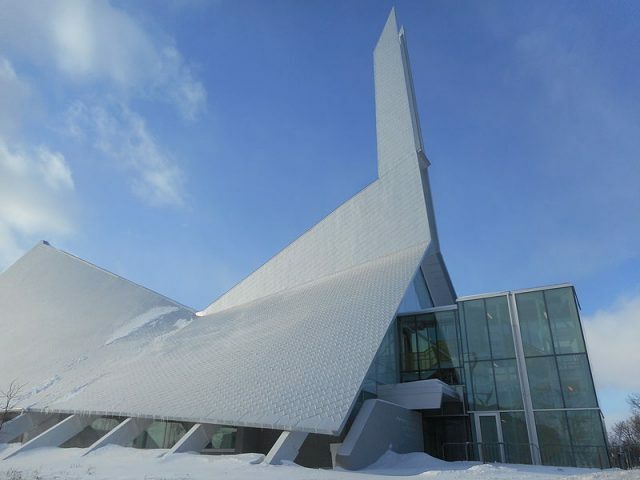 His Denys-du-Plateau Church in Quebec stands out as a truly avant-garde take on traditional Catholic architecture. The church was built in 1964, with a white, narrow roof which completely blends in with the snow during harsh Canadian winters. It was deconsecrated in 1986 and turned into a library, named Monique Corriveau after a local female author who was a resident of Quebec City. The library once again emphasizes the link between religion and literacy, insisting on the overwhelming sensation of whiteness to symbolize enlightenment. 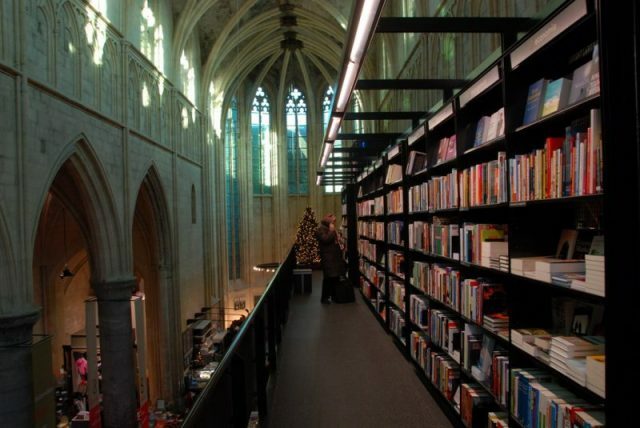 The entrance to this shrine of knowledge is through a glass atrium which leads to the name of the former church, filled with bookshelves and reading tables, all in the purpose of providing maximum comfort for students and book enthusiasts alike. 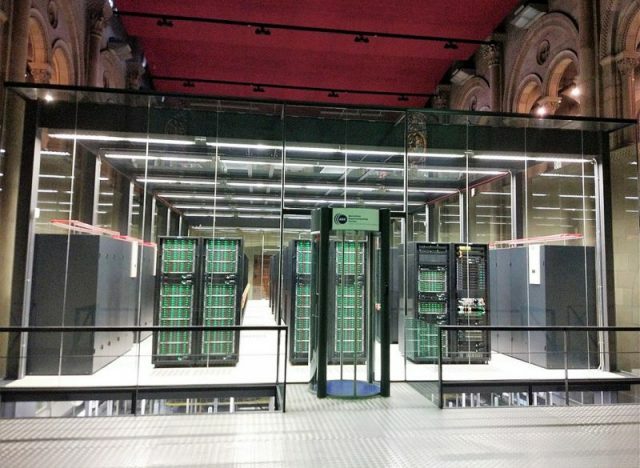 Among the strangest location choices to house a supercomputer is most probably Torre Girona Chapel in Barcelona, which has been the property of the Polytechnic University of Catalonia since the 1970s and had previously been in the hands of the wealthy Girona family. The 19th-century church was rebuilt in the 1940s, in the years following the Spanish Civil War. 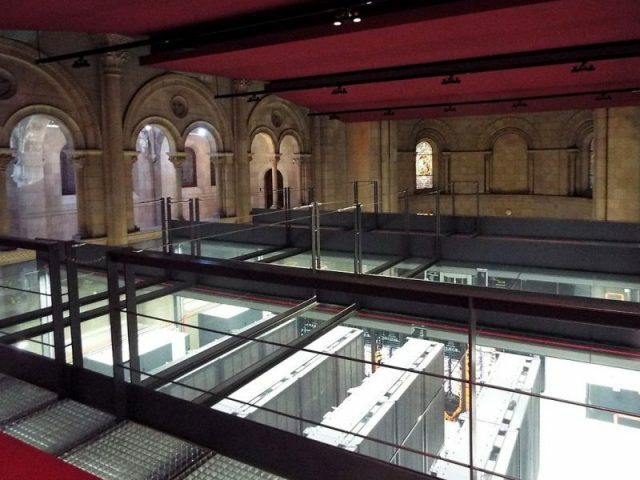 The church’s interior was adjusted to house an enormous glass box that encases the $40 million MareNostrum supercomputer. 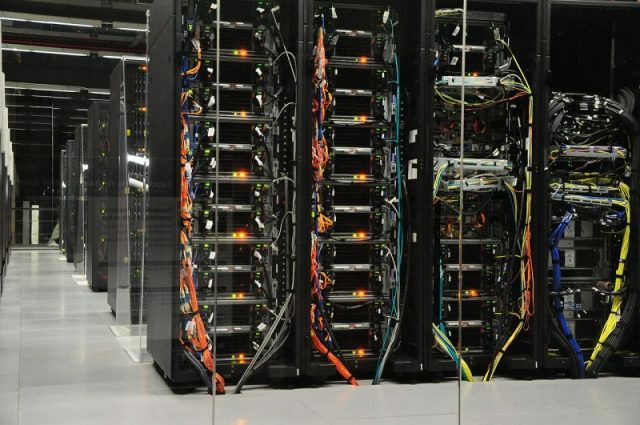 It was formally established as the Barcelona Supercomputing Center on April 1, 2005. MareNostrum, now in it’s fourth incarnation, is regularly utilized in a wide range of scientific research and has contributed to fields such as astrophysics, climate modeling, and genome research. A 19th century Methodist church was actually dismantled from its original location and moved some 50 miles, to a charming vineyard in the Ohio countryside. Vineyard owner Gene Sigel spotted the old, abandoned church up for sale in 2000 — just for the price of dismantling it. 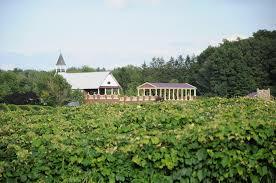 He purchased the church and relocated it to become part of his winery complex, where it stands to this day. 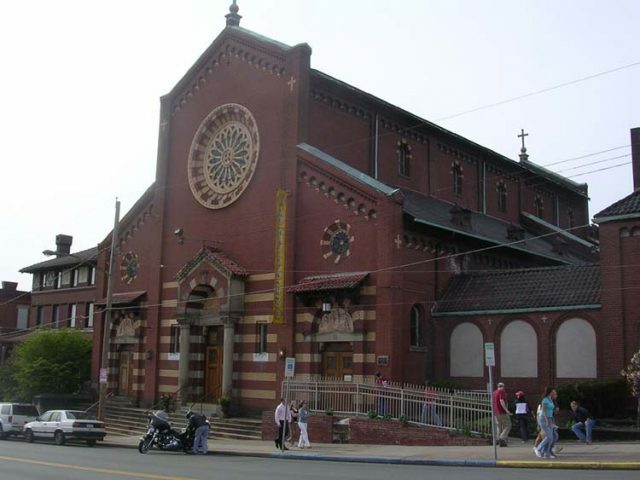 The Lawrenceville neighborhood parishioners used to gather in the Church of St. John the Baptist, but since 1996, the church has been involved in a completely different type of “religious” practice. Three years after the church was closed, a craft beer manufacturer obtained the right to use it for their beer production. 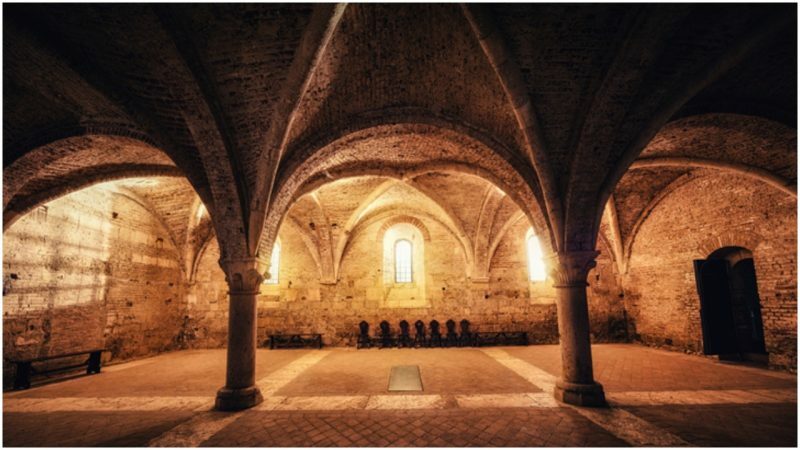 This might seem odd, but just as literacy and science are intertwined with the history of religion, alcohol has also featured as a big part of monastic life, especially in the Middle Ages. Trappist monks all over Europe were well-known for their famous beer, which is still produced in thirteen monasteries of the order, one of which is located in the United States. Therefore, the guys at Church Brew Works are only continuing the tradition. Although they are not monks, they have been recognized as high-quality brewers by the Great American Beer Festival, which bestowed them with the Large Brewpub Brewer of the Year Award in 2012.